A mutual ko threat, also referred to as a double ko threat, is a position which can be used as a ko threat by either player, leaving no threat for their opponent. It is thus only a threat for whoever plays there first. A mutual threat is usually a miai in which each player makes a play, regardless of who plays first. It can also be a local ko threat, as in an example of removing a local threat, or non-local, as in the following examples. Typically a player should play all mutual ko threats before starting a ko fight to prevent the opponent from playing them, so they are not normally used in ko fights. See remove double threats before you first capture the ko. 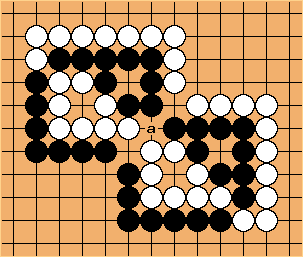 In this position, a and b are miai, Both players must get one of them in order to live. Either by getting two eyes or by getting seki. If it is White’s turn to find a threat, she can play b, to which Black must respond a, or a, to which Black must respond b. The same goes for Black. In this position, Black typically gets a and White b. Either black a or white b may be used as a ko threat, threatening to gain 6 points in two moves. Both players’ mutual ko threats can happen to be on the same spot.